Going through menopause early can be a frustrating and upsetting experience. Early menopause is generally defined as beginning the transitional process between the ages of 41 and 44. Sometimes, even women under the age of 40 experience drastic hormonal imbalances, or conditions that require a hysterectomy, which might induce early menopause. On top of the general irritation of normal menopausal symptoms, women who start menopause early may also find themselves coping with the emotional implications of losing their fertility at an unusually young age. There are, however, a number ways that you can deal with early menopause that will ease discomfort and improve daily life. Menopause comes with a variety of potentially troublesome symptoms, which may make it even more difficult to manage for women experiencing early onset. Common symptoms such as hot flashes, night sweats, mood swings, and other physical changes can be disruptive to your daily routine. It's important to know that these symptoms result from the hormonal imbalances that characterize the menopause stage. When managing physical discomfort, you should aim at the source: hormone levels. The first and most important step in this process is to maintain a healthy lifestyle. This includes a balanced diet, regular exercise, proper hydration, and plenty of rest. These aspects of your overall health are key to regulating hormone levels. Some women may find that efforts to improve their lifestyle are not quite enough to manage physical symptoms. In this case, there are a number of herbal remedies that have proven effective at balancing hormone levels in many women. In extreme cases, and sometimes more often during early menopause, women may turn to hormone replacement therapy (HRT) to treat symptoms. This should only happen under the supervision of a doctor and should be a last resort, as it is associated with a number of medical risks. Early menopause can be a difficult and uncomfortable subject to breach because women who are experiencing it often feel alone. However, it is important to communicate openly about what you are experiencing, whether with friends, family, your doctor, or your counselor. There are other women in the same situation, and you may find a support group of women you can talk to either online or in your area. There is no avoiding the difficult emotional implications of early menopause: it is a challenging condition to have, and it can come on very unexpectedly. It's understandable if you need to take a break or some time to yourself. Have a hot shower, go for a walk, read a book, curl up with a movie, and allow yourself to process what you're feeling. It is important to care for your emotional well-being during this time. Early menopause can be a frustrating experience for young women, and there is no one way of dealing with it. If none of the above suggestions aren't working for you, there are other ways you can lessen the physical symptoms and emotional trials of early menopause. 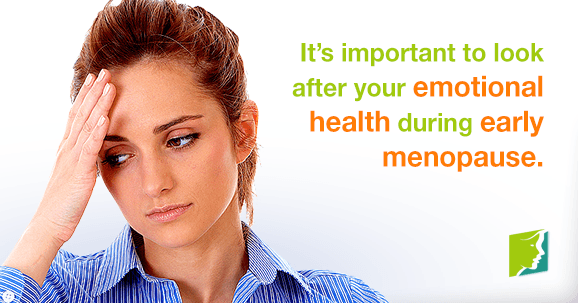 To learn more about early menopause and how to manage it, follow the links below.